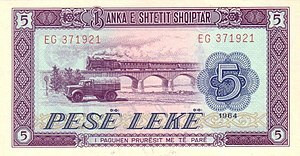 "Lekë" redirects here. For other uses, see Leke (disambiguation). 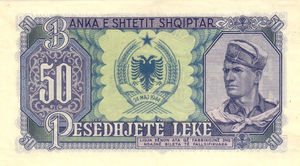 The lek was introduced as the first Albanian currency in February 1926. 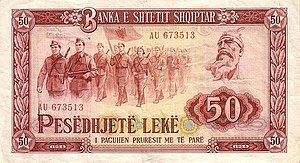 Before then, Albania was a country without a currency, adhering to a gold standard for the fixation of commercial values. Before the First World War the Ottoman Turkish piastre was in full circulation, but following the military occupation of the country by various continental powers the gold franc (Franc Germinal) was adopted as the monetary unit. 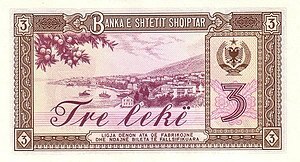 In 1923 Italian paper circulated at Shkodër, Durrës, Vlorë, and Gjirokastër, and the Greek drachma at Korçë, the values of which varied according to locality and the prevailing rates of exchange as compared with gold. 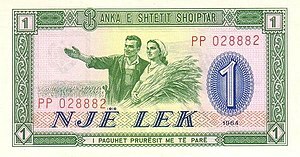 The lek was named after Alexander the Great, whose name is often shortened to Leka in Albanian. Alexander's portrait appeared on the obverse of the 1 lek coin, while the reverse showed him on his horse. The name qindarkë comes from the Albanian qind, meaning one hundred. The word is thus similar in formation to centime, cent, etc. 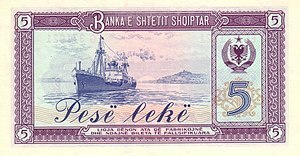 Between 1926 and 1939 the name Franga was used for Albanian gold currency worth five Albanian Leke for use in international transactions. A similar alternate name Belga was used for units of five Belgian francs. In 1926, bronze coins were introduced in denominations of 5 and 10 qindar leku, together with nickel ​1⁄4, ​1⁄2 and 1 lek, and silver 1, 2 and 5 franga ar. The obverse of the franga coins depicts Amet Zogu. In 1935, bronze 1 and 2 qindar ar were issued, equal in value to the 5 and 10 qindar leku respectively. This coin series depicted distinct neoclassical motifs, said to have been influenced by the Italian king Victor Emmanuel III who was known to have been a coin collector. These coins depict the mint marks "R", "V" or "L", indicating Rome, Vienna or London. Under the direction of Benito Mussolini, Italy invaded and occupied Albania and issued a new series of coins in 1939 in denominations 0.20, 0.50, 1 and 2 lek in stainless steel, and [text missing?] 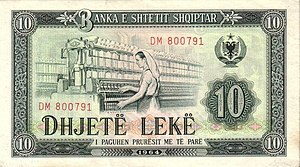 silver 5, and 10 lek were introduced, with the silver coins only issued that year. 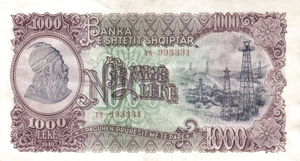 Aluminium-bronze 0.05 and 0.10 lek were introduced in 1940. These coins were issued until 1941 and bear the portrait of Italian King Victor Emmanuel III on the obverse and the Albanian eagle with fasces on the reverse. 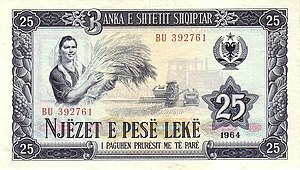 In 1947, shortly after the Communist Party took power, older coins were withdrawn from circulation and a new coinage was introduced, consisting of zinc ​1⁄2, 1, 2 and 5 lekë. These all depicted the socialist national crest. This coinage was again minted in 1957 and used until the currency reform of 1965. In 1965, aluminium coins (dated 1964) were introduced in denominations of 5, 10, 20 and 50 qindar and 1 lek. All coins show the socialist state emblem. In 1969, a second series of aluminum 5, 10, 20, 50 qindar and 1 lek coins was released commemorating the 1944 liberation from fascism. 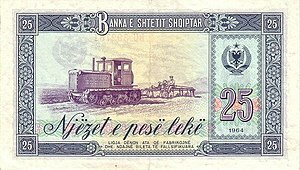 The three smallest denominations remained similar in design to the 1964 series but depicted "1944-1969" on the obverse. The 50 qindarka and lek coins showed patriotic and military images. In 1988, a third redesign of aluminum 5, 10, 20, 50 qindarka and 1 lek coins was released. 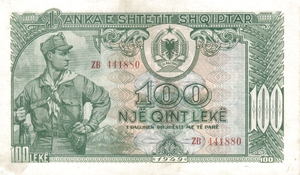 The 50 qindarka and 1 lek coins were problematically identical in size, weight, and appearance, so aluminum-bronze 1 lek coins with the inscription "Republika Popullore Socialiste e Shqipërisë" were released later that year for better identification. 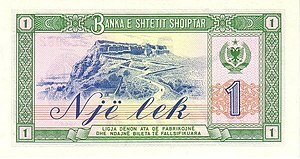 In 1989, a cupro-nickel 2 lekë coin was introduced. All three of these coin series remained in circulation during and shortly after the 1991 revolution. 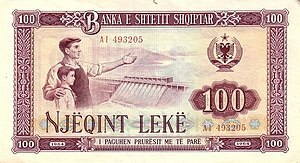 In 2001, 100 and 200 Leke were issued under the theme of Albania's integration into the EU and 50, 100, and 200 Leke under the 500th anniversary of the Statue of David. 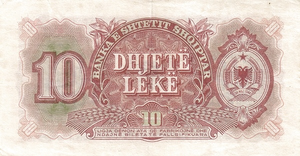 In 2002, 50 Leke and 100 Leke were issued for the 90th Anniversary of the Independence of Albania and 20 Leke under the Albanian Antiquity theme. 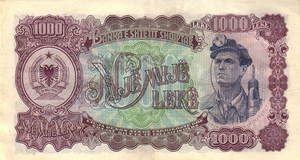 In 2003, 50 Leke was issued in memory of the 100th anniversary of the death of Jeronim De Rada. 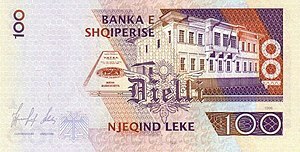 In 2004, 50 Leke was issued under the Albanian Antiquty theme depicting traditional costumes of Albania and the ancient Dea. 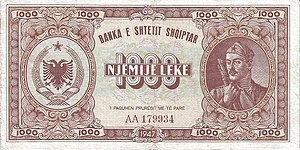 In 2005, 50 Leke were issued for the 85th anniversary of the proclamation of Tirana as capital and the theme of traditional costumes of Albania. 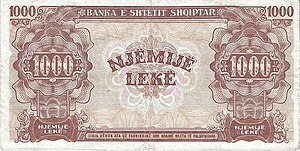 In 1926, the National Bank of Albania (Banka Kombëtare e Shqipnis) introduced notes in denominations of 1, 5, 20 and 100 franka ari. In 1939, notes were issued denominated as 5 and 20 franga. 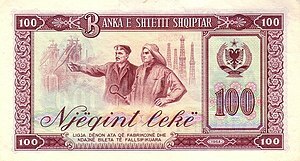 These were followed in 1944 with notes for 2, 5 and 10 lek and 100 franga. 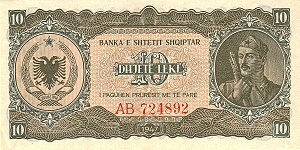 In 1945, the People's Bank of Albania (Banka e Shtetit Shqiptar) issued overprints on National Bank notes for 10 lek, 20 and 100 franga. 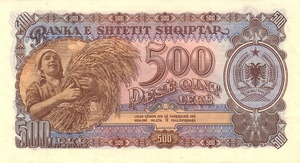 Regular notes were also issued in 1945 in denominations of 1, 5, 20, 100 and 500 franga. 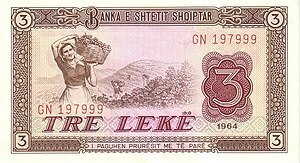 In 1947, the lek was adopted as the main denominations, with notes issued for 10, 50, 100, 500 and 1000 lekë. 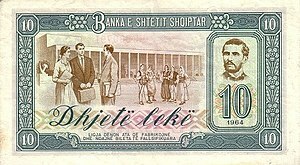 On 11 July 1997, a new series of banknotes dated 1996 was introduced. 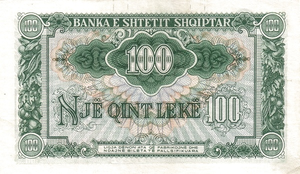 Notes dated 1996 were printed by De La Rue in the United Kingdom. ^ "Albanian Gold Coins - Albania". taxfreegold.co.uk. Archived from the original on 5 December 2013. 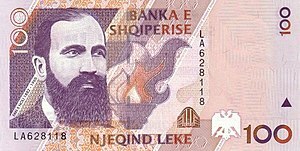 ^ "Mirësevini në faqen e Bankës së Shqipërisë". 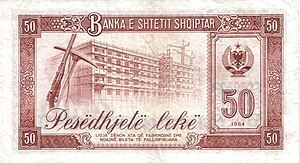 www.bankofalbania.org. Archived from the original on 16 November 2017. 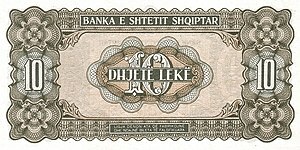 Wikimedia Commons has media related to Banknotes of Albania.